Looking for a quick, last-minute idea for Valentine’s Day? 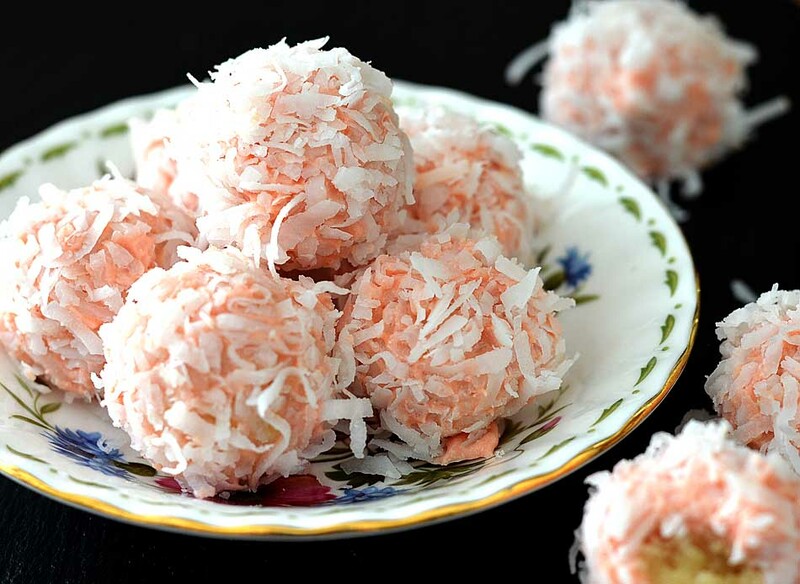 These decadent treats are so simple, your kids can help you make them! 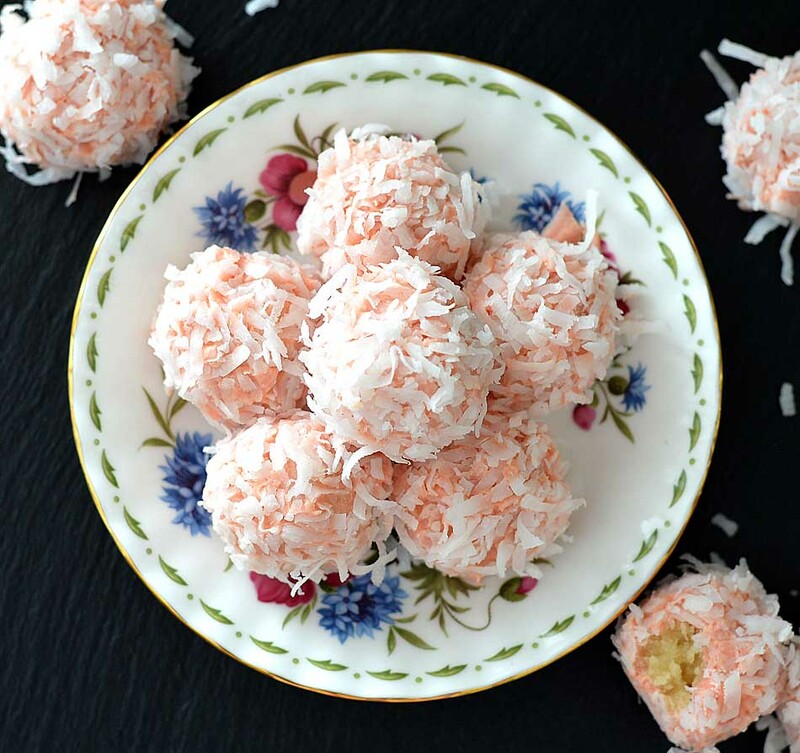 Vegan White Chocolate Covered Sugar Cookie Truffles are an indulgence, not and every day thing. The center is comprised of, you guessed it, pre-made sugar cookies mixed with a bit of vegan cream cheese combined in a food processor. Think cake-pops! Coated in white chocolate that I have tinted pink for the occasion and rolled in angel flake coconut. You could choose anything here: nuts, mini chocolate chips, sprinkles, etc. I just loved the way the coconut looked. The first order of business was to whip up some sugar cookies. I had a box of gluten-free mix from when I made this Immaculate Blueberry Sugar Cookie Tart (Immaculate Baking Co. is the box mix). I just sub out the eggs for something like applesauce, whipped silken tofu, etc. I break them up to get a head start in the food processor and pulse a few times. This is the texture you are going for. Fine crumbs. Now it’s time to add the softened vegan cream cheese. You don’t need much. 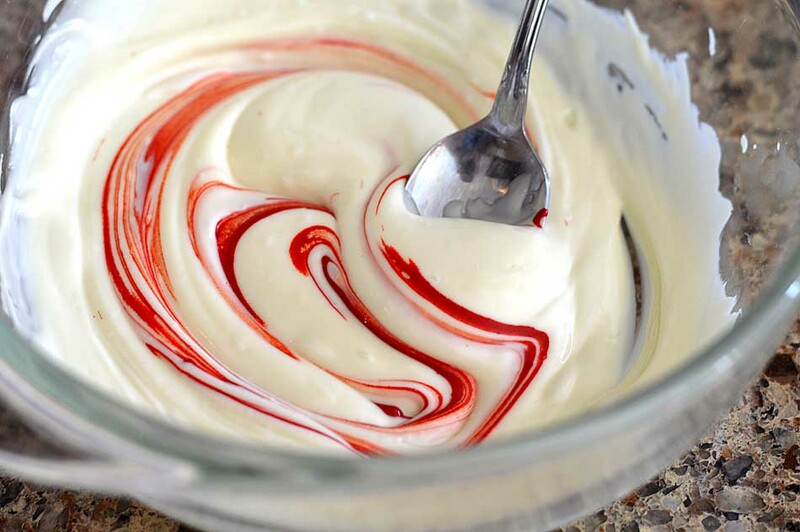 The cream cheese acts as a binder, but also gives us that creamy texture. Once it comes together, they should look like this when scooped. 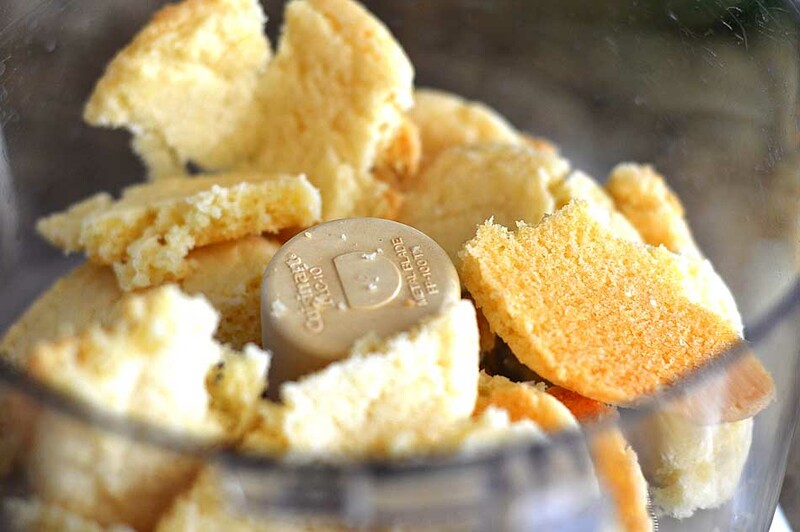 I use a mini cookie scoop for uniformity and then roll in my hands to get them smooth. You can find dairy-free white chocolate chips in most specialty stores or on Amazon. I melt mine in the microwave and add a bit of soft pink food coloring. It looks dark now, but it is a beautiful, almost ballet shade of pink. 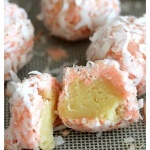 Using two forks, I dip the balls into the white chocolate to completely cover and then immediately roll in the coconut. Place these on a parchment or silicone-lined baking sheet to firm up. I actually prefer to keep mine refrigerated, so you could also briefly chill these prior to serving. I serve these tiny Vegan White Chocolate Covered Sugar Cookie Truffles on the saucers that come with my teacups for presentation. They are very rich, so make them small. A cup of hot tea might pair nicely. I hope you enjoy! 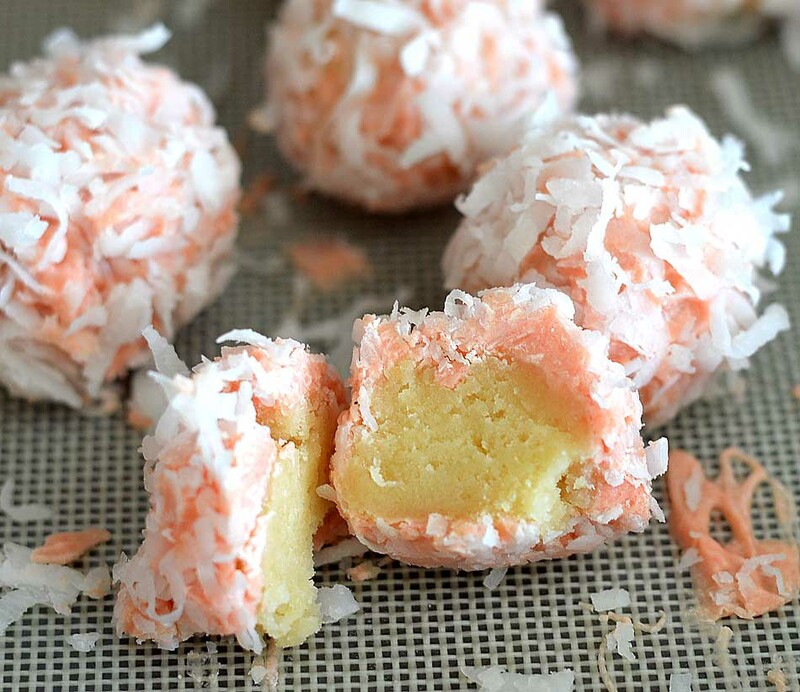 Did you make this recipe for Vegan White Chocolate Covered Sugar Cookie Truffles? If so, leave me a comment below and let me know what you thought. You can also tag me on Instagram @theveglife1 so I can see! 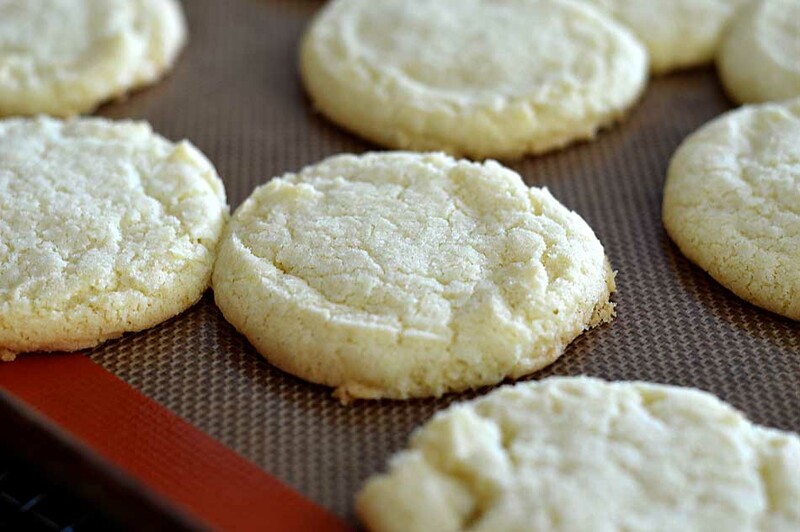 The first step is to bake up some of your favorite sugar cookies. You could also use store bought. 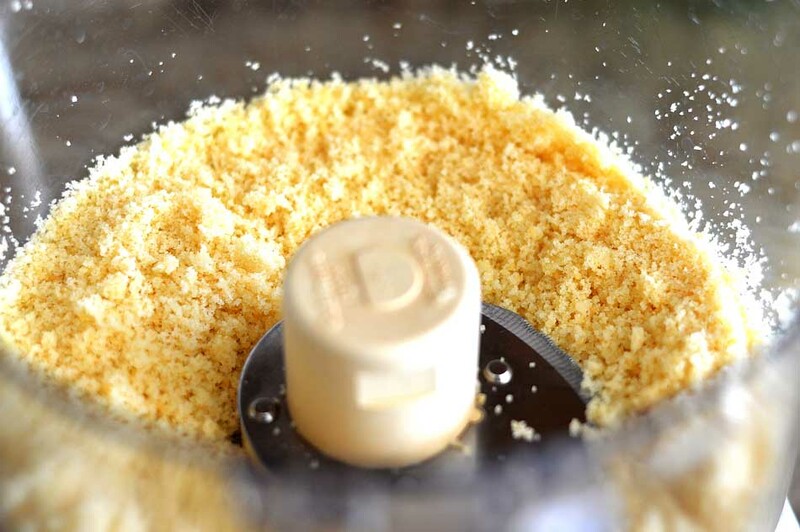 In the bowl of a food processor, break up the cookies into a fine crumb. Add the softened vegan cream cheese. Keep processing until it comes together like a dough. Now, using a small cookie scoop, portion out the dough onto a parchment or silicone lined baking sheet. Using your hands, roll into smooth balls. Melt white chocolate chips in the microwave or over a water bath. Stir until smooth and fluid enough to coat the balls. If using the microwave, go slowly taking care not to scorch the chocolate. Tint the chocolate with the food coloring. A little goes a long way. 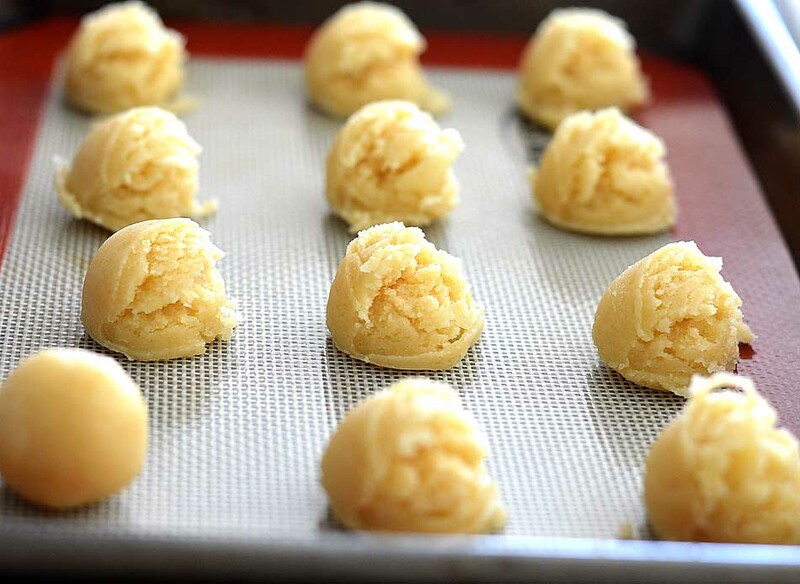 Using two forks, toss the balls in the white chocolate until coated. Allow any excess to drip off. 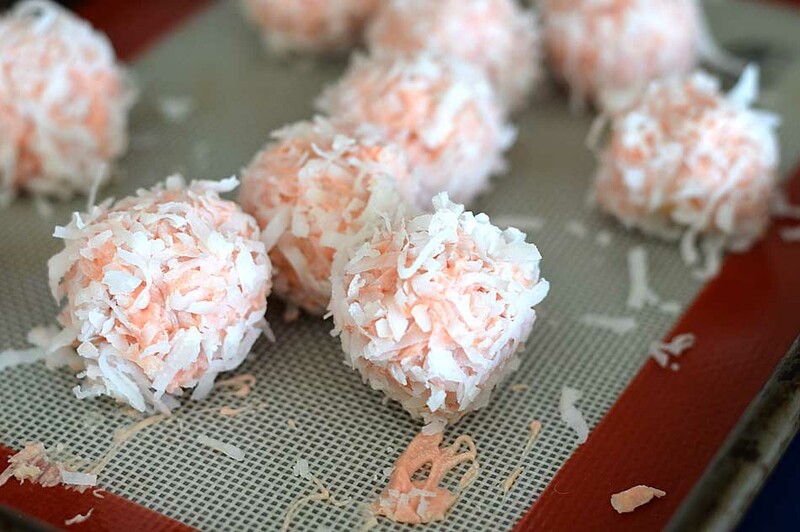 Immediately roll them in the coconut flakes and place back on the parchment or silicone baking mat to cool and set up. I like to store mine covered in the refrigerated, but you can also just chill them briefly if serving immediately after making. I have a question about the directions. You said 1 cup of egg sub, but then say 1/4 vegan sour cream, 1/4 coconut cream, 1/4 coconut cream. Do you mean a 1/4 cup of each of these to make 3/4 cup? Or is it 1 cup total of any one of those? Hi Aimee (nice to meet a fellow Aimee 🙂 I am sorry about that. Still trying to get used to my new recipe plugin and it got a bit jumbled in the viewable recipe. So it’s an egg-replacer (equivalent measurement of 1 egg) and I’ve re-worded the description, so hopefully it’s a bit clearer. It’s either 1/4C vegan sour cream OR 1/4C coconut cream OR 1/4C Cashew Cream. Most egg-replacers will give you a measurement equivalent to 1 egg. You also have the option of buying the vegan sugar cookies if you can find them. Sorry for the confusion. Thanks so much for the clarification. 🙂 I don’t get to meet many people who share the name Aimee. Pretty cool! Can’t wait to try these. I’ve pinned them for later.